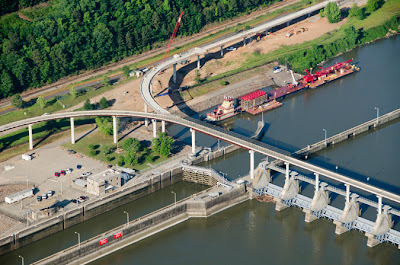 The last section of concrete has been poured on the Big Dam Bridge's southwest approach. Representatives from Pulaski County, the U.S. Army Corps of Engineers, Mobley Contractors, and Garver celebrated the construction milestone last week. The southwest approach to the Big Dam Bridge over the Arkansas River is the second phase of a pedestrian and bicycle bridge concept that began in 2002. The bridge, completed in 2006, is constructed above the Murray Lock and Dam, and the Society of American Travel Writers just named it one of the top 10 bridges to visit in the United States. The southwest approach provides bicyclists a route to connect with the Two Rivers Bridge without attempting a tight 180-degree turn, and pedestrians will get a great view of the lock and dam from an upstream vantage point. 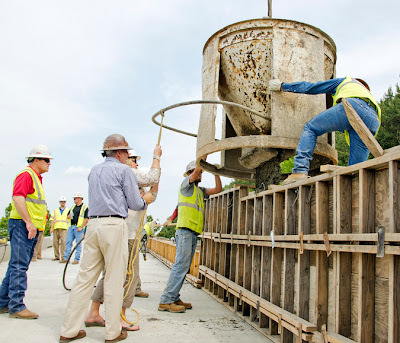 Pulaski County Public Works Director Sherman Smith and Road and Bridge Director Barbara Richard (pictured above) participated in the final pour by pulling the handle to release the concrete and form the final barrier wall. Others in attendance included the U.S. Army Corps of Engineers-Little Rock District Commander Colonel Glen Masset and Dam Safety Program Manager Bob Oberle. Even Hot Dog Mike stopped by as part of the festivities. The southwest approach should be complete by early fall. 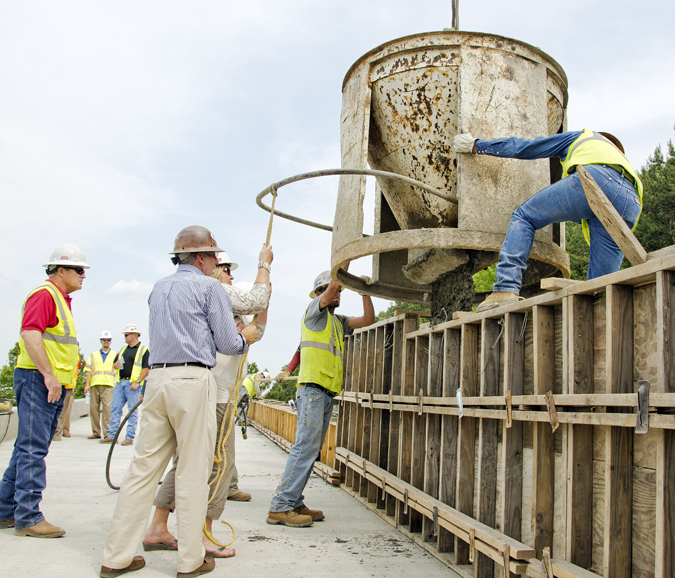 The project uses nearly 1,300 cubic yards of concrete and brings the bridge's total length to approximately 5,270 feet. The new leg of the bridge features a 325-foot curved steel plate girder unit, MSE approach ramp, cofferdam construction, and elevated observation platform. In addition, three architectural towers are being constructed on top of the observation platforms.